They say if ain’t broke don’t, fix it. And there’s very little to fix with Disney’s 1991 animated classic Beauty and the Beast. Whatever issues it may have are tertiary nitpicks spawned from the endless stream of Cracked and Buzzfeed articles, essays, theories, parodies, and fanfics. The animation was beyond beautiful, the characters lovable, and the songs undeniably catchy. So revered is it that it became the first animated film to be nominated for an Academy Award for Best Picture. And now Disney has attempted to give their animated classic the same live-action treatment they’ve given to the likes of The Jungle Book and Pete’s Dragon. Those previous movies were based on some of Disney’s lesser material, with directors finding new ways to improve them and carve out unique stories. But what is there to improve on with Beauty and the Beast? Did we need to see the prince’s powdered face and decadent dances before the curse changed him into a hairy monster? Did we need to watch a flashback of pathos for Belle as her mother tearfully succumbs to the plague? And did we really need to hear all the same songs sung again in the same tone with stiff choreography? I wanted to give this adaptation the benefit of the doubt and view it as its own film given that it’s tackling one of the best animated movies ever made. Sadly, it doesn’t give me much choice when it keeps shoving the original songs in my face. The title fades and we open on the awakening village, where Belle (Emma Watson) strolls through town while singing about “This provincial life.” Though it’s played in the familiar melody, there’s a certain electricity missing from the visuals—it’s a lively song that portrays a bustling town of bakers and washers, yet the place seems strangely slow with life. Belle will later sing this song again when she runs up the grassy hill, and if you’ll recall from the animated movie, she wanders around the grass and caresses flowers as she sings about seeking something more in life. Watson, on the other hand, merely stands firm as she sings, as though she’s more performing a recital than marveling at life’s possibilities in the great wide somewhere. Even Julie Andrews found more to do when she got up that hill. Watson does her best to embody Belle’s tenacious spirit of reading and inventing (more so than the animated movie), but she doesn’t quite have that emotive edge. When she first visits the castle to discover the frightening Beast (Dan Stevens), she doesn’t seem very fearful of the cursed prince—it could be that his goat-like face and muscular body aren’t as scary when concealed in filthy garb, but she could still act more terrified to sell the Beast’s intimidation. The castle she visits is an amazing feat of architecture with winding stairways and crumbling towers, but she still doesn’t seem mesmerized by the experience—how could you not be floored by the sight of the candelabra Lumière (Ewan McGregor) performing a vivid and stylish show for dinner? This is probably the most unbelievably amazing thing Belle will ever see in her lifetime, and she acts as though it’s her third time watching the show at Benihana. 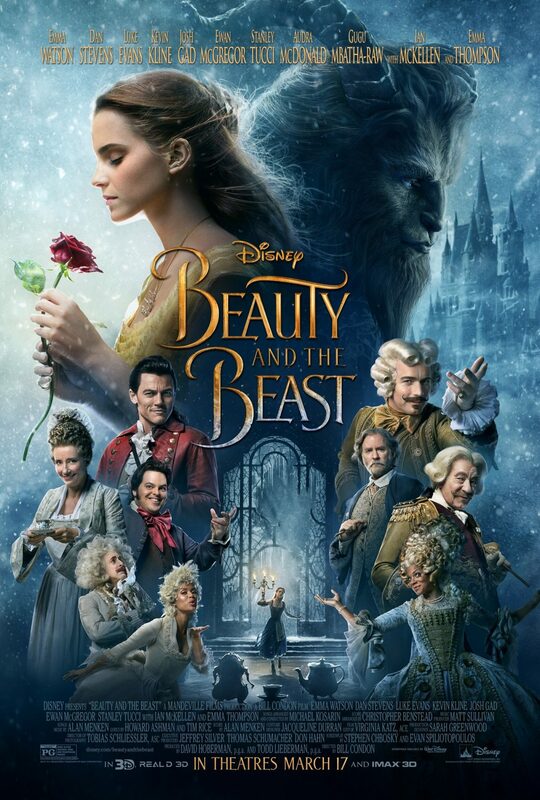 The movie proceeds through all the familiar beats, songs, and settings, but with a certain lack of spark in the relationship between Belle and the Beast. There’s more of romance between the macho Gaston (Luke Evans) and his squat servant LeFou (Josh Gad), and that’s not a compliment—doing more than the cackling and singing of his animated counterpart, LeFou actually has a personality in the live-action film, but his obsession over Gaston borders on creepy. That said, he becomes a more sympathetic character as he starts to question his loyalty to Gaston, which is clearly not reciprocated. While this new perspective is applied to a few other side characters, they remain as side characters to the central relationship of Belle and the Beast, despite their surprising lack of chemistry. To give the movie a twinge of originality, certain aspects are added in to expand the community of the town and the mysticism of the castle. Unfortunately, these additions do little to improve the story and often complicate it with holes. There’s a beggar who hangs around the town and is referenced various times, telegraphing her true identity for the third-act reveal without much surprise. The Beast shares with Belle a magical atlas that can transport them to any place in the world, which I first thought was an illusion of Belle’s mind akin to the Holodeck, but it’s revealed that she visits these places in real time and can actually take back items with her from this mystical transportation. So why couldn’t she use this power to quickly rescue her father from being locked away? The Beast doesn’t seem as cooped up and lonely if he can take off to Paris any time he likes, joking which landmarks might be touristy. Is this foreshadowing for Beauty and the Beast: Hawaiian Vacation? Certain scenes also come off more cold and artificial than they did in the original. The most magical of the scenes from the animated film features Belle and the Beast dancing in a golden ballroom with a massive ceiling and chandelier. This scene is restaged for the new film with the same song and costumes, but the room is surprisingly small, with low-hanging chandeliers. All the servants trapped in household items are present, but they are so realistic in textures and material that they’re far scarier than the Beast, even when voiced perfectly by the likes of Ian McKellen (Cogsworth) and Emma Thompson (Mrs. Potts). Meanwhile, the climactic battle at the end features the Beast and Gaston duking it out on the castle roof, jumping between turrets and towers without much excitement in the obvious computer graphics. I felt so bad for not being won over by the new Beauty and the Beast that I had to go back and watch the original to make sure I wasn’t comparing this picture unfairly. The sad truth is that I saw more life, charisma, and energy from the animation than I did in Disney’s live-action retread. There may be something there that wasn’t there before with the addition of new songs, new character arcs, the inclusion of black characters, and the gay moment with LeFou, the last of which has been overly hyped and is not actually the least bit provocative. But Disney seems to have spent so much money and time on recreating one of their most beloved animated films for live action that they didn’t stop to think if they should. You know, besides the obvious financial gain for exploiting nostalgia. While director Bill Condon does put forth his best foot for us to be his guest, his production comes off less as a full-course meal and more as microwaved leftovers.